Albert (Jeremy Irvine) forms a strong bond with his horse, Joey. He trains him and teaches him skills that no one believes possible. He is then left devastated when he finds that his father (played by Peter Mullan) has sold Joey to Captain Nichols (Tom Hiddleston) to serve in World War 1. He promises Joey that they will find each other again - somehow. We then follow Joey and his experiences on both sides of a war that is brutal for both the men and the horses involved. Click Here To Join Our Movie Club! I have to admit that I was not looking forward to watching War Horse. For a start, I am not a Micheal Morurgo fan and, as a result, I have neither read the book nor watched the film. In addition, the combination of a script by Richard Curtis, direction by Steven Spielberg, a score by John Williams and sad horses made me worry that I would be in emotional turmoil throughout. I mean, I only have to think about ET and I am in floods. So, I started to watch this film on the lookout for and steeled against any sentimental moments. Funnily enough, I didn’t cry at all. I could see the exact moments where I was meant to and I did come close on a few occasions but the film didn’t push me over the edge (thankfully). However, I am now left wondering why. I mean you have probably realised by now that it doesn't take much for me to tear up while watching films. 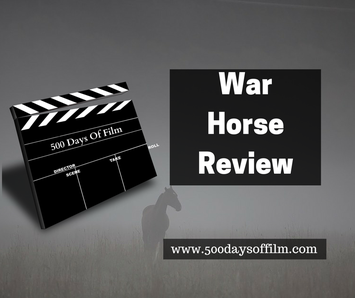 War Horse moves through several episodes in Joey’s eventful life where he meets lots of characters for short periods of time. Is the episodic nature of the film the reason why I didn’t feel swept away emotionally? Maybe. Perhaps I was too aware of the sentimentality that it got in my way. What I am sure about is that War Horse is gorgeous to look at - every scene is beautiful. The shots of Devon are magical and almost otherworldly. The war scenes form a stark but nonetheless equally stunning contrast. In addition, Spielberg is careful to keep the performances of his horses as natural as possible and yet they are still so expressive. I really cared about Joey - much more than I cared about any of the human characters if I am honest. Over eight million horses died in World War One - a fact that we should not forget and something that gives War Horse significant historical importance for its target audience. This film is rated 12 by the BBFC and for good reason. While there is no actual gore in this movie there is a lot of human and horse death. There are also a lot of themes that could prove difficult for younger children. I enjoyed War Horse and believe in the important story that it seeks to tell. I just wasn’t as swept up as I expected to be. Another superb and emotional score from the phenomenal John Williams. I think it is important to consider War Horse's target market when watching the film.